Driscoll on twitter 2-25-2016 "Forgiveness takes on person. Reconciliation takes two." I generally have no interest in or use for Twitter. Twitter has been one of those things that people get into and a line from Jane Austen's Emma just sticks with me, where half the people in the world take pleasure in things the other half can't even understand. Sometimes reconciliation takes a few more people than that, of course. So if reconciliation takes two people and it's been about nine years since the 2007 re-org Driscoll can tweet pious bromides about how reconciliation takes two people but reconciliation's easier to do if you're in the same state, assuming a person wants to reconcile. But to go by other tweets Driscoll has done on forgiveness we can't simply assume reconciliation is seen as "necessary". A key perceived benefit of forgiving someone can be that you free yourself to move on with your life. Around that same time Driscoll also tweeted this opaque axiom, possibly intended for Mars Hill insiders since it seems to have nothing to do with the rest of the stuff you'd find in his twitter feed from that period. Now after the October 2014 resignation of Mark Driscoll it could sure seem to a lot of people that a healthy transition is not exactly what happened or there would still be a Mars Hill today. It seems as though what Mark Driscoll did in resigning could be described as chucking the baton and storming off the track rather than going through a healthy transition and a hand off that allowed the relay to continue. It's tough to know how cogent the analogy is since Driscoll always seemed more baseball than track and field. But it sure looks to a lot of people like Mark Driscoll chucked the baton and stormed off the track rather than comply with the restoration plan he told Brian Houston he agreed to submit to. Did he? Did the BoE get to finish their investigation? Was there even a report? The fact that there is no longer a Mars Hill raises the question of how healthy the transitions have been. Even if the transitions have been healthy it's hard to shake the sense that in later 2014 Mark still chucked the baton and stormed off the track. For a guy who spent his years at Mars Hill telling people to live for a legacy he seems less than eager to discuss his legacy these days. Finally ... here's another tweet on forgiveness from 2013. There are more caveats about what forgiveness is and isn't that Driscoll shared over the years. Forgiveness doesn't entail reconciliation, obviously, it can also be a gift you give to yourself so you can move on with your life (which may also not entail any reconciliation). And there's an extra thing, forgiveness doesn't mean you can't avail yourself of law enforcement to punish the person who offended you, too. Forgiveness does not, as some say, preclude temporal consequences. Okay, that can be given ... but it's interesting to wonder whether or not this lexicon of what forgiveness is and isn't is easier for a person to be on the giving end rather than the receiving end. After all, it's easier to be on the "giving end" of a forgiveness that 1) may forgive but severs relationship, 2) "moves on" literally and figuratively, and 3) even invokes the power of law enforcement to punish the sinner after "forgiveness" has been given than to be on the receiving end of that kind of forgiveness. And for a guy who up until recently said "It's all about Jesus", would Mark Driscoll want Jesus to extend THAT kind of forgiveness to him? ... propaganda demands vertical liaison among the party's organizations. This vertical liaison permits both homogeneity of propaganda and speed of application; and we have seen that speed of action or reaction is essential to propaganda. Conversely, in view of the effect of propaganda in creating isolated social and local groups, any horizontal liaison inside the party would be disastrous. Those at the base of the party would not understand why one propaganda is made in one place, another elsewhere. On the contrary, the partitioning by propaganda must correspond to a partitioning within the party, and the only liaison system must be vertical. Ellul wrote that the most amazing instrument of propaganda was the small group. In the small group a homogenous social experience was possible and it was possible to have all the interpersonal life necessary to form a tight bond on the one hand and be a useful instrument for a partisan group on the other. In the earlier years of Mars Hill the idea of small groups or studies, in the wake of Dead Men at least, was that people could join groups that were discussing parts of the Bible members wanted to learn more about. In a few years, however, the small groups became re-organized around discussing whatever Driscoll was preaching, in itself a crucial step toward transforming a small group into a potentially autonomous unit that could discuss scripture in a way calibrated to the needs of the group toward using the small group as a way to reinforce discussion of Mark Driscoll's teaching. I was in a group that met just early enough in the week (not that Wednesdays were necessarily "early") that at the group I was part of we might at times abandon any pretense of discussing the sermon. The group leader might just say "Eh, we all heard the sermon. How's everybody doing? What's stuff we should pray about?" I liked this group, quite a bit actually. That was ten years ago, though. In 2007 with the re-org everyone was expected to pick a campus affiliation and stick with it. The City got introduced and affiliation ensured that you only got the information pertinent to your campus affiliation. Access to everything else was eliminated. Under the second era of Midrash (from 2002 to 2007 prior to the re-org) it was open access across all locations during the start of multi-site. When the firings took place this became a problem, apparently--it was too easy for hundreds of people to communicate across the culture. The Midrash got shut down and replaced by The City. Was it Munson who once said that The City was the ideal top-down communication platform for elders to let Mars Hill know what was going on? Maybe. Fuzzy there. But what was less fuzzy was that if you had a community group affiliation with Ballard while actually attending Lake City you could discover in 2009 that what the Ballard attenders were talking about was a sermon you hadn't even heard yet. That's the kind of situation I was in. I hadn't stopped attending entirely but I didn't formally renew membership, either. By accident of circumstance I was discovering that while I'd hear about layoffs about once every 12 to 18 months from the Ballard side of things I'd hear from the Lake City side that things were so financially stable "we" were subsidizing Ballard at times to help them out because they had some troubles. From a donor cultivation perspective it seemed there was a potentially clear explanation for this--the people who were faithful attenders that actually had money perhaps switched to Lake City while Ballard got the less committed visitors who were there for the Mark Driscoll show. That's how it seemed circa 2009. But with some help from Ellul it's now possible to look back and say that what was happening to me could be described as a "horizontal liaison". Mars Hill had committed to meteoric growth and to top-down information partitioning to go by how they ran The City. Having been at Mars Hill since later 1998 and not interested in burning bridges I'd managed to cultivate a network of people I knew across a good number of the campus sites. By later 2013 the leadership of Mars hill was certain who blogged at Wenatchee The Hatchet. What they apparently didn't know was how many sources were leaking content from The City to Wenatchee The Hatchet; who they were; and how it was done. It was reported that at least one person within the leadership culture of MH was willing to speculate a hack. That was never the case. Sources volunteered content. What wasn't volunteered, by and large, was information I could look up myself because my City access wasn't revoked until the spring of 2012. How on earth did Wenatchee The Hatchet have City access? Recruited for beta-testing in the pre-launch phase, that's how. In the kind of leadership culture that evolved at Mars Hill Mark seemed to be concerned with who was going to lead the mission. The nice people who just sat on the bus and shut up and didn't do anything (as Mark defined "anything") could just be allowed to ride along. They wouldn't get thrown off the bus because they weren't even pretending to have an interest in driving the bus. They weren't opposing the bus, either, so there was no need to run them over with the bus. And because they just sat on the bus and maybe helped out in a limited way it didn't occur to the leaders that maybe an impossible-to-fully-identify group of people just sitting on the bus could, if you will, take detailed notes about what the bus driver was saying about where the route was going and share that. At a social media presentation Driscoll gave in 2013 he mentioned that a lot of the traffic to Mars Hill sites could fit into the "long tail", older stuff Mark had said or written that people were still looking up. As Wenatchee The Hatchet began to carefully document historical revisions to the story of Mars Hill (and mined Driscoll's sermons for history of real estate acquisitions and leadership appointments or lessons on spiritual warfare that figuratively and literally demonized dissent against executive leadership) stuff began to get pulled from the Mars Hill media library. But by the time that started to happen other avenues of "horizontal liaison" were possible. People within Mars Hill began to figure out that they could not only communicate across the campuses within but also share information with people considered outside Mars Hill. The beginning of conflicting and irreconcilable accounts from the top down may have started as far back as the 2007 trials. Longtime readers may recall Wenatchee The Hatchet published an email from an executive pastor sent prior to the trials that explained a "reconciliation process" had been completed. Later in 2007 there was the order to shun, so much for reconciliation process. Which ... thematically ... could get us to something recent on Twitter. Of mainstream coverage summarizing what has happened, yes, it's the best overall one so far. So far the best coverage done by secular publications has, easily, been The Stranger. Of course here at Wenatchee The Hatchet some effort has been taken to document things as they happen but, you know ... blogs. They don't count in the same way as a publishing platform the way a magazine does. In other words, if Mars Hill is a kind of mini-denomination of its own, who has the legal, as well as the doctrinal, right to investigate and then pass judgment on its founder? You can see hints at this confusion at several points in the Times report. Since Driscoll would go on to resign in October 2014 the answer as to who had the legal and doctrinal right to investigate and then pass judgment on the founder was, ultimately, just Mark Driscoll. We'll potentially never know what the Board of Elders appointed to assess Driscoll may have ever decided because it's not even entirely clear they ever even completed their investigation. The Board of Overseers or the Board of Advisors and Accountability weren't the same as the BoE. It seems a bit optimistic to hope that Matt Rogers (who was on both the BoAA and the BoE in the final formal year of Mars Hill) would talk to Julia Duin about what was going on. Kerry Dodd hasn't stopped listing himself as the president of Mars Hill just yet ... . The inactive date for the corporation formerly known as Mars Hill is still pending. Ellul on the shift an individual makes from adhering to propaganda to embracing the propaganda of the "enemy" in the face of doubts--a possible explanation of what the "cage phase" is. Moreover it is possible to provide successive stages for the individual. While he is still a solid member of a group, propaganda can introduce a factor of ambiguity, of doubt, of suspicion. But the individual finds it very difficult to remain long in such a situation. Ambiguity is painful to him, and he seeks to escape it. But he cannot escape it by returning to his previous certainties and total blind allegiance to his former group. This is impossible because the doubt introduced can no longer be assuaged while the individual remains in the original context of values and truths. It is then, by going over to the enemy group, by compliance with what provoked the ambiguity, that man escapes that ambiguity. He then will enter into an absolute allegiance to the truth of the enemy group. His compliance will be all the more radical, his fusion with it all the more irrational, because it is a flight from yesterday's truth and because it will have to protect him against any return to, memory of, or nostalgia for the former allegiance. There is no greater enemy of Christianity or Communism than he who was once an absolute believer. Anyone get the impression that this could describe just about any "cage phase" embrace of just about anything? It sures seems applicable. and it doesn't just so happen ..
Of course there's another potential application of this observation. It's not just that someone who was once some kind of Christian or communist might be a sworn adversary of those beliefs. Ellul's proposal could apply to any ideology that could be disseminated by way of propaganda. For the sake of a thought experiment let's take Mars Hill. If someone were inside Mars Hill and perceived it's core to be complementarianism because young guys found a sense of purpose then if the seed of doubt were arguments for egalitarianism or feminism then, in Ellul's proposed possible rejection of propaganda, the person who bailed on Mars Hill might embrace egalitarianism and feminism not necessarily "just" because the person sincerely embraced that because of the dynamics of propaganda and the way a human acclimates to propagandistic dynamics. If while within a setting like Mars Hill a person got the impression that the "enemy" was a high church liturgical approach or Orthodoxy or Catholicism then in the process of eliminating ambiguity a person could embrace the "enemy" and go for Orthodoxy or Catholicism. If someone inside a setting like Mars Hill where many a lad embraced some variant of libertarian economic ideas and market idealism a person might embrace progressive economics and politics as an abjection of what was once perceived to be the central cultural "point" of Mars Hill. The collapse of Mars Hill, if you will, as a propagandistic apparatus, could well have left people in Seattle more progressive than they otherwise would be in the sense that those who discovered that Driscoll's blue collar shtick was potentially just that, might either reject that or ... paradoxically embrace progressive ideals by doubling down on what they believe to be a "real" working class ethos that would contrast with what seemed to be a ploy on the part of Driscoll's years of talking about guys swinging hammers for a living. Changing your convictions through an intellectual, social, emotional and spiritual struggle is certainly valuable--but Ellul's writing could be a useful caution that merely shifting from one hard and fast position to another is not a sign that you have stopped "drinking the kool-aid", it might be a sign that you're drinking more sugar-water than ever but for a different team. Anyone who leaves a cultural setting like Mars Hill was may have already gone through a "cage phase" or two. On the other hand, discussing Mark Driscoll's persona in terms of propaganda may be a useful approach. Why? Because apart from whomever he's had meals with in the Phoenix pastor scene the most common way people are going to have contact with Driscoll is by way of technology, by means of the mass and social media platforms that Ellul described as inherent in propaganda. A "regular" person may be as connected to Mark Driscoll as he or she would be to, say, Taylor Swift or George Clooney, which is to say not in the way that a real friend would be. To borrow a polemic evangelicals have used about certain types of entertainers ... there's a pseudo-intimacy, an illusion of intimacy and personal connection that can happen in propaganda. It's not necessarily "Big Brother", it could also be an illusory sense of connection to a popular musician or movie star. Or ... some other kind of star, perhaps. So many people have tried to get at what they felt the mentality of the scene was it can be easy to miss that a lot of the scene was mediated by mass and social media. Remember that at its peak most people who called Mars Hill their church home were hearing a sermon mediated by a disc that Driscoll preached a week or so earlier that got filmed and re-mastered for distribution at the sites. In church service terms that's like watching an episode of Blues Clues on a Friday when the episode first aired on a Monday within the same week. But for those who called Mars Hill home they sincerely thought of Mark Driscoll as their pastor. So in keeping with the thematic arc of this post it's not too huge a surprise that many people who left Mars Hill gravitated toward higher liturgical traditions, perhaps in part because church mediated by screens really isn't church in quite the same way that a church service where the pastor or priest presents eucharist. By now it's probably clear to those who have trudged through these posts inspired by Ellul that any megachurch could be described, almost by definition, as fitting the working definition of a propaganda machine as outlined by Ellul. It's not that liturgical churches can't participate in propaganda, that's hardly true at all. On the ther hand, if a church chooses to forsake propaganda a church that isn't a megachurch will have an easier time of it by dint of not being defined in practice by using the tools of propaganda. First thing, for those who don't recall local radio host Dori Monson was not able to confirm the rock-throwing incident took place after consulting Woodway authorities. a commenter later added an update that something happened of some kind. But the confirmation of a rock-throwing incident at the house in Woodway, if true, highlights that Driscoll wasn't giving Russ Bowen an honest answer in 2014. Now keep in mind somebody how sounded astonishingly like Mark Driscoll told Russ Bowen "wrong address" when Bowen tried to ask a few questions. And a dog got released. That was in August 2014. By May 2015 somehow things changed. Driscoll was sharing a story about a helicopter overhead trying to flush him out for an interview. What wasn't the house in 2014 was the house after all in 2015. So there's already a conundrum Mark Driscoll created for himself in how he replied to Russ Bowen. If the rock incident happened at the Woodway house then Driscoll couldn't honestly have told Bowen "wrong address". Last year there was a substantial windstorm in the Puget Sound area and one of the areas effected by that storm (August 2015) was Woodway. This might have been the reference Driscoll made in his recent presentation in Wenatchee. So that a storm caused damage across Woodway is easily established for late August 2015. 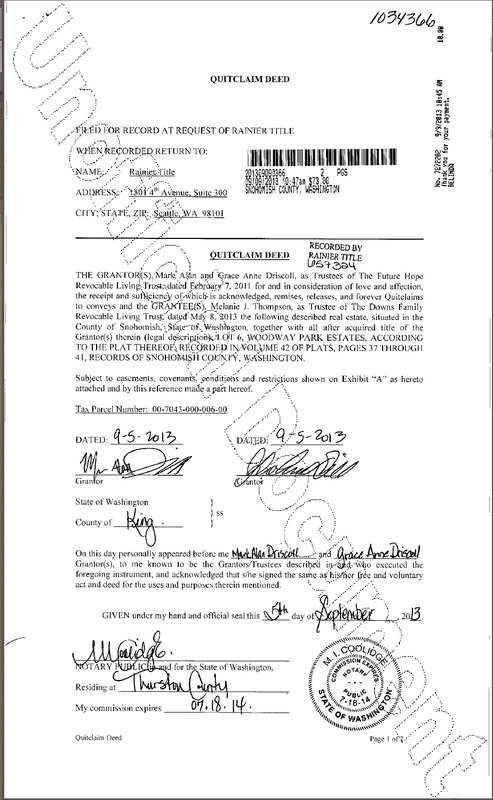 But there's a possibility that the house didn't really formally belong to Driscoll, after all. Didn't the house get gifted to the Downs Family Revocable Living Trust by Future Hope Revocable Living Trust in 2013? So if the Downs Family Revocable Living Trust financial instrument had Melanie Thompson designated as its trustee how was this house at Woodway Mark Driscoll's house? Some say the potential use of a revocable living trust is to obscure who the real owner of a piece of real estate is so "perhaps" the Woodway house was always Mark Driscoll's house, it's just it wouldn't seem to be the case on paper. So maybe Driscoll wasn't exactly lying to Russ Bowen ... but then if he wasn't misrepresenting the strictly factually accurate situation then the circumstances in which the Woodway house that wasn't Mark's when Bowen came to visit has apparently been the Driscoll house in Mark's stories on the road two calendar years in a row. It seems as though there's a risk in sharing stories in 2015 and 2016 about that house in Woodway. If it wasn't Driscoll's house in 2014 then he wasn't exactly lying to Russ Bowen on camera but if it really was Driscoll's house then even if some kind of paper arrangement ensured the real estate formally belonged to the Downs Family Revocable Living Trust but it was really ultimately Mark Driscoll's home then Driscoll lied to Bowen by implying there was a wrong address or misunderstanding in 2014. By 2015 Driscoll had tales on the road of how the media published the address to his house and sent a chopper to fly over the place and here in 2016 Driscoll's shared a story about how a big tree fell on the house and would have killed him and Grace had they been in the bedroom that was once theirs. Fortunately nobody died. Unfortunately Mark Driscoll, in sharing this more recent bit of news about the real estate, presented what seemed to be the Woodway house as his house in a way that still suggests he was not being honest with Russ Bowen back in 2014. If you’ve read this far, I’m certain the Holy Spirit has convicted you of lying somewhere, sometime in your life. I’m guilty. Of lying? Of being a liar? Was Mark Driscoll really admitting that much? In his discourse on deception he stopped short of saying that Mr. Spock implying something was lying and there may well be those who think Driscoll's response to Russ Bowen was by some technicality not a dishonest answer. Or perhaps it could be suggested that to protect the kids a dad might lie. There's casuistry within the Judeo-Christian tradition on those kinds of issues. But for as emphatically as Driscoll said "wrong address" in 2014, some of his most poignant and pointed appeals for sympathy have centered around the condition and location of the house he wouldn't confirm to Russ Bowen of KOMO news was his. If the house wasn't the Driscoll house then it wasn't honest to say so and if it was the Driscoll house it wasn't honest to even imply otherwise. Driscoll could have relied on the old standby of so many who have refused to talk to members of the press "no comment". Since Mark Driscoll registered practically every sermon he ever preached going as far back as 2001 under his own name rather than that of Mars Hill; and since Driscoll registered the copyright to himself or a corporate stand-in for nearly all of his books that are all still in print and getting translated into a variety of languages it's just a teensy bit difficult to believe that "all" the wealth and equity of the Driscoll clan was in that house in Woodway. For what purpose was the On Mission LLC set up years earlier if "all" of the Driscoll wealth was loaded into that one house in Woodway? On Mission LLC still exists as an entity in good standing in Colorado, doesn't it? It may make for a more dramatic narrative to say "all" the wealth of Mark Driscoll's family was in that house in Woodway (if that's the house Driscoll was referring to in his recent sermon), but not counting the intellectual property Driscoll has in sermons going back to 2001 on or all of his published books would seem to be skipping over the most valuable part of Mark Driscoll's assets. Without those there'd be no 1 Corinthians series of 33 sermons from 2006 to bring back online at Mark Driscoll Ministries, would there? Remember a link that assessed Driscoll's value as around 2.5 million? So perhaps like a Calvinist (if Driscoll would still call himself one) "all" doesn't seem to literally mean "all". If "The Bible has nothing good to say about young men" why didn't Mark Driscoll notice that back in 2007 when he made Jamie Munson legal president of Mars Hill? The bible has nothing good to say about young men. Now, sure, people have contested the reliability of this sweeping assertion. Driscoll mentioned that "young men" meant anyone under 40. So by the account of the synoptics Jesus died as a "young men" and he was sinless. So there's one young man in the Bible there. There's the advice to Timothy not to let anyone look down on him because of his youth, a verse that Driscoll seemed more swift to remember and quote circa 2000. But let's consider all this from another angle. Mark Driscoll made a young man who was a convert to Christianity of the Driscollian kind into the legal president of Mars Hill back in 2007. Jamie Munson was made president of Mars Hill back then and let's recall that when the termination and trial process got rolling Munson mentioned that grounds for immediate dismissal included not trusting or respecting the spiritual authority of executive leaders (e.g. guys like Jamie Munson or Mark Driscoll). Driscoll was, what 37 or 38 in 2007? He, too, fit the definition of "young man". So if we take this axiom seriously that the Bible has nothing good to say about young men then when Munson claimed that a total lack of trust for executive leadership was an issue perhaps it could be said in defense of Meyer and Petry that "if" Driscoll's axiom is right and that the Bible's got nothing good to say about young guys then why SHOULD Meyer have trusted Munson or Driscoll's judgments regarding the 2007 by-laws? Driscoll's axiom this year might suggest that the distrust from a previous decade is vindicated by Mark Driscoll's own axiom. it would seem that Driscoll's sweeping axiom about how the Bible's got nothing good to say about young men simply raises the question of why anyone thought he, as a young man, was ever suitable for ministry. SOMEBODY thought he was. He surely thought he was and even claimed God told him to start planting churches. See, Driscoll once claimed one of his big mistakes was submitting himself to elders who were young and new and green even though he was the spring chicken of that set on the one hand and, on the other ... it made it all the more inexplicable why he put Munson in charge of Mars Hill if it was a mistake to load the leadership up with guys under 40. Driscoll made a point of saying when Munson resigned that Munson was always above reproach. Driscoll made Munson president by his own account. Was Driscoll going to second-guess his own judgment in making a guy as young as Munson president of Mars Hill? I had a job as a concierge and a belhop at a hotel when I was younger and I kinda had this view of God as a concierge and a belhop. You tell him what you want and he goes and does it and if he doesn't do it, well, then he's not very good at his job. Is he sure he doesn't still have that view? But that's not necessarily what we're going to look at here. Driscoll mentioned there's 33 sermons coming back, the 1 Corinthians series that describes as dating from 2007. Uh ... 2007? Had to listen to it a few times to be sure he really mentioned that year. Let's go back and consider what sermons were preached in 2007 by Mark Driscoll. There was Redeeming Ruth (January to February 2007); there was Nehemiah (February to September 2007) with some Titus (July 2007) and The Rebel's Guide to Joy (a Phillipians series from October 2007 to December 2007). There was no 1 Corinthians series. That was all in 2006, January to September 2006. You can see for yourself since, at least for the time being, robots.txt isn't getting in the way. I would have thought that the guy could remember the dates for his own sermons. It'll be interesting to learn how much content remains from the series, since it was in the 1 Corinthians sermon series from 2006 that discussions about sweet real estate acquisitions came up. Jonna Petry publishes brief addendum to "My Story", states that Driscoll has not reached out to the Petry family since Joyful Exiles began. There hasn't been any persuasive plausibility to the "we're not entirely sure who they are" claim Driscoll made back in 2014. If Sutton Turner could invite me (if by proxy) to a Vision Breakfast there's no particularly clear reason why the executive leadership of Mars Hill, up to and including Mark Driscoll, wouldn't have an idea who Paul Petry is. Driscoll couldn't tell people on the road that a conflict from years ago came to light and still be an honest man if it was true that 'we're not entirely sure who they are", can he? Driscoll preached recently on men and godliness. He talked a bit about how the man is the head in the marriage covenant as the head of the household. Mars Hill was once a church in which the elders had a covenant relationship (so it was said) with the body that was the church. Driscoll was the president and that would imply headship over the body that was Mars Hill. If Driscoll wants to keep running with these kinds of metaphors then Driscoll can be seen as a head that decided to leave its associated body, a disembodied head rolling along from state to state doing speaking engagements. If Driscoll's still holding the line on how headship means who a man's children date is his responsibility and even maybe the grandkids ... that does invite a question as to why, when the plagiarism controversy erupted, Mars Hill PR thought there was any reason at all to mention some people helped with the assembly of the Trial study guide materials. If it was just Mark Driscoll's name on that intro it was Mark Driscoll's responsibility as head. About ten minutes in Driscoll talked about putting his house on the market. Which house? The one in Woodway? He hasn't technically owned that since it was gifted to Melanie Thompson back in 2013. Now, to be sure ... the taxpayer on that real estate has changed. Okay, so maybe Driscoll lied to Bowen about whether it was the Driscoll house in 2014 before regaling folks at Thrive with tales of the chopper flying above the house and scaring the youngest Driscoll kid. But then technically the house wasn't owned by a financial instrument set up by Mark Driscoll. In which case that can't be the house that was recently sold, can it? Unless Driscoll referred to the Woodway house "as if" it were his house even though he hasn't formally/legally owned it on paper since 2013. Unless, of course, there's a possibility that the ownership on paper was just that and that the Driscolls and the Fab Five lived in the Woodway house through 2014 in spite of the on paper ownership. Some have proposed that the advantage of having real estate owned in a trust is that it can conceal who really owns/lives at the real estate. But it certainly wasn't the old real estate at Montlake. The Driscolls sold that back in December 2014 not long after Driscoll resigned. On the other hand ... Driscoll was preaching at a church in Wenatchee and the Driscolls had a piece of property in Chelan. Perhaps that's the real estate that sold? For those who may not already know, the most widely read post in the history of Wenatchee the Hatchet was a memo that advised Driscoll get a raise to 650k compensation in addition to the 200k housing allowance he already had. So where ever that old house was it might have been just enough of an operational expense it had to go on the market. Thing is, it doesn't seem like it was necessarily the house in Woodway or the one on Montlake in Seattle. Maybe the house in Chelan sold? That the Driscolls had a house in Chelan was something mentioned from time to time but not something that seemed worth nailing down in the wake of the more newsworthy development of a resignation. If it was the Woodway house can someone confirm via a headline that the house got hit by a tree? So if the executive level leadership of Acts 29 said "X" couldn't it be construed that McPherson has said "not X" by featuring Driscoll at Grace City Church in Wenatchee? There's two core questions here. 1) why has Acts 29 become so coy about what they were once so publicly firm about in 2014? 2) if Acts 29 leadership hasn't changed their mind and Acts 29 associates were informed of the reasons to consider Mark Driscoll no longer fit for ministry why did Josh McPherson or associates extend a speaking engagement to Mark Driscoll?